There really are countless applications and websites available to us these days when it comes to travel. Gone are the days of oversized maps, printed itineraries, guide books and paper trails – now, everything we could ever need access to while exploring abroad is right at the tip of our fingers. We all travel a little differently, so it’s only logical that there’ll be an app or website that suits us all differently. There are FAR more around than what I’ll be listing below, but I thought I’d cover my top picks – one’s that offer travellers something a little unique. Let’s kick things off with apps for our smart phones and tablets. Being that they’re such a portable form of tech, it’s the best to turn to when travelling (less is more when you’re on the road! Especially when it comes to what you’re carrying around with you). With so much of our paperwork these days coming in electronically, our inboxes are inundated with seemingly endless subscriptions and newsletters, so much so that it makes the important information in there hard to find! Especially when it comes to flight and hotel bookings. Filters, folders and flags all help, but what if there was a separate app for that, one that could organise all of your holiday plans in the one place! Good news is – there IS an app for that. TripIt is a handy travel organisation tool for those on the go allowing you to keep all of the information you need in one easy to find place. When you make your bookings, simply have the itineraries and confirmations forwarded to plans@tripit.com. From there, the app will automatically arrange all of those details into one handy, easy to read itinerary that you can access with ease. A handy little app that will help you remember exactly what to pack for your destination. The only thing it won’t do is pack your bags for you! 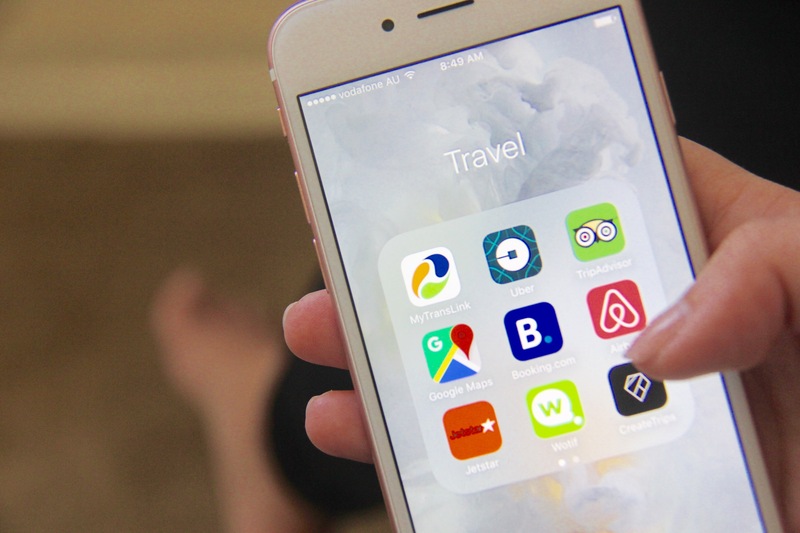 This app is perfect for the list-maker, the organisers and serious travel pros. PackPoint helps you to organise what you’ll need to pack in your luggage based on the length of your trip, the weather at your destination as well as must-haves for the activities you’ll be doing once you get there. Simply punch in the city you’re traveling to, the departure date, number of nights you’ll be staying and – voilà! PackPoint not only takes into account the need for warm or cold weather clothes, but also checks to see if you’re willing to repeat a few basic items like tops and bottoms and whether or not you’ll have access to laundry facilities. This handy app will help you to pack smart and could even avoid airline luggage overage fees! A spontaneous getaway, a road trip that leads to a nights stay or just a mid-week escape from the daily grind. If you find yourself looking for some last minute accommodation, Hotel Tonight is a great app to turn to! With a list of un-sold rooms from hotels, you can score some pretty amazing last-minute deals. Easy to search and easy to book (secure your room in as little as a few taps and a swipe), Hotel Tonight only features hotels that they’ve screened so you know you’ll enjoy your stay. Another great app for the organised, or the carefree wanderer that likes to keep the necessities in one easy-to-access place. CreateTrips is a social trip planner for the smart traveller, allowing you to plan trips yourself or with friends. Search venues and add them to your trip plan and gain access to plans and guides by other travellers for some inspiration! Once your plans are complete, you can package them up together with offline maps, meaning you’ll avoid any nasty data roaming charges and won’t be lost without a wifi connection. You can even publish your own plan as a travel book, giving you the opportunity to make money from your guide! Lonely Planet are world renowned in the travel scene, and for good reason. Their reputation of putting together outstanding books and guides is stellar and they’ve always been my go-to when I’m planning a trip abroad. 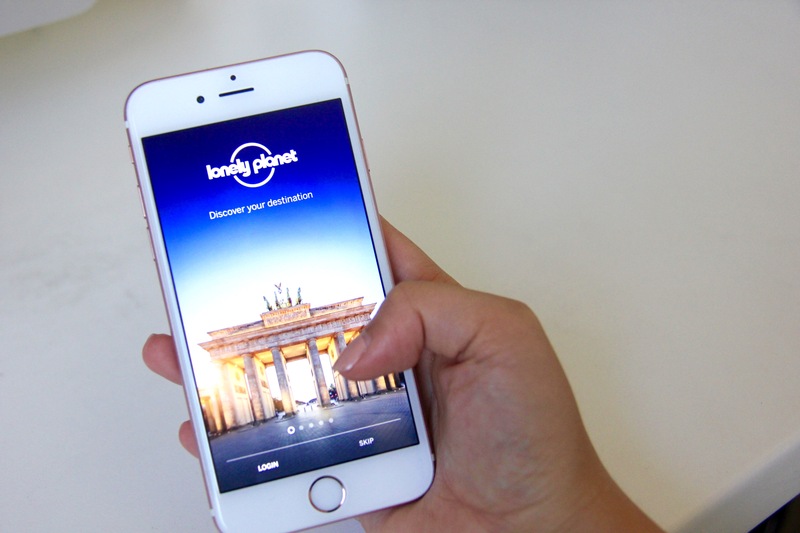 Keeping up with the times, with less people packing paper and instead turning to technology to assist them, LP have gone and done travellers a solid and created an app full of city guides. Packed with tips and advice from on-the-ground experts, this nifty little app has everything you need to cover new cities in the palm of your hand. Sights, activities, offline maps, bookmarking and helpful tips – it’s a pretty powerful little tool for discovering your destination. If you’re going abroad and don’t know the native tongue at your destination, this app is a must install. As well as being able to type and translate 90 languages, automatically translate speech and draw characters with your finger, this app allows you to use your phones camera to translate text instantly (in 26 languages). Simply point your lens at the street sign/restaurant menu/timetable and it’ll translate the text in real time! The best part is that it works without the use of internet, which is a big bonus when free wifi isn’t always readily available. Sounds kinda silly, doesn’t it? But when you’re wandering about a new city and mother nature calls unexpectedly, this app will have you counting your lucky stars! With more than 70,000 toilet facilities listed, you’re bound to find one near you. So uncross those legs, whip out your phone and you’ll be on your way to a loo near you. Keeping in touch with your fellow travellers or friends and family back home is MUCH easier today than it was before. Gone are the days of long distance phone calls or letters, instead replaced with instant contact via technology we can keep right in our pockets. So long as you have an internet connection, these two apps are a great way to send unlimited free texts or calls to others that have the app themselves. 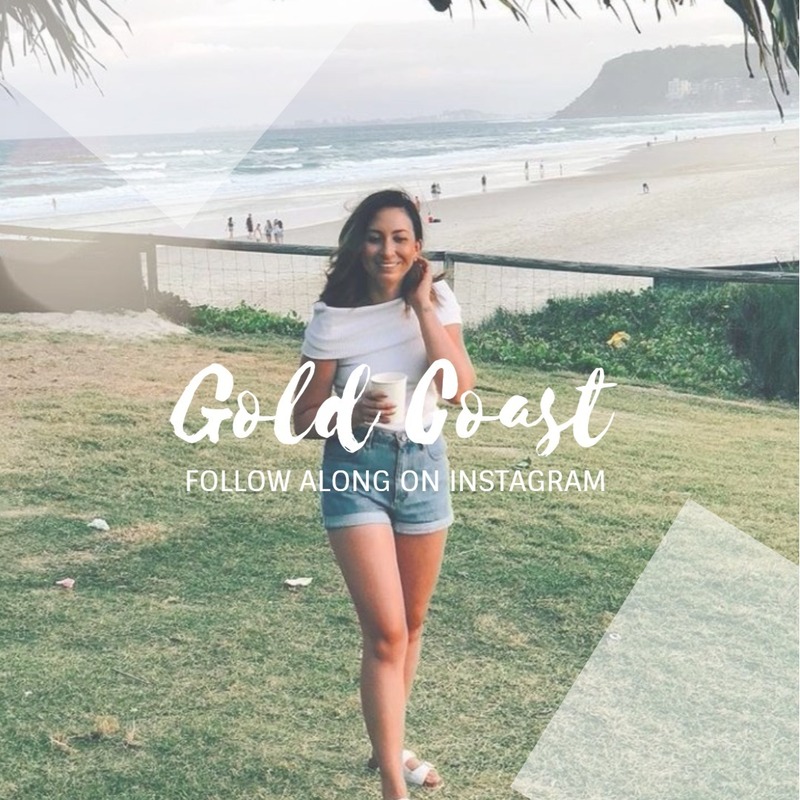 Although not a travel app in it’s own right, Instagram provides an endless amount of inspiration, destination ideas and advice! Simply search a few different hashtags (either #travel, #passionpassport, #wanderlust or the city you’re interested in) and you’ll find thousands of photos and traveller accounts on where to go and what to see! These days, postcards seem to be an out-dated form of communication and tend to be nothing but a novelty souvenir from trips abroad. We’ve all see them stacked in wire spin racks across the globe, with typical photos of sites or cities on the front. With these kind of mail deliveries quite rare these days, nothing is sweeter than opening your mailbox to discover a card penned by your friend abroad (in amongst the bills and catalogues you usually find in there). So next time you’re on holiday and want to send a little note back home, instead of taking to Twitter or Facebook, why not make it more personalised with the use of the Touchnote app! This app allows you to create your very own postcards – load the photos you’ve taken and either make a collage of many or choose your hero shot before writing a message for your loved one to read. This card is then printed for a small fee and sent for FREE from one of Touchnotes print centres around the world, meaning it will usually arrive much quicker than your standard post card would. This beautifully refined app allows users to create stories using their own photos, videos and text. After a unique way to share your travels with friends and family or the world? Perhaps you’re a budding photographer looking for a fun and easy way to share some of your favourite travel snaps? Stellar lets you create stunning visual stories utilising simple-to-use design themes. 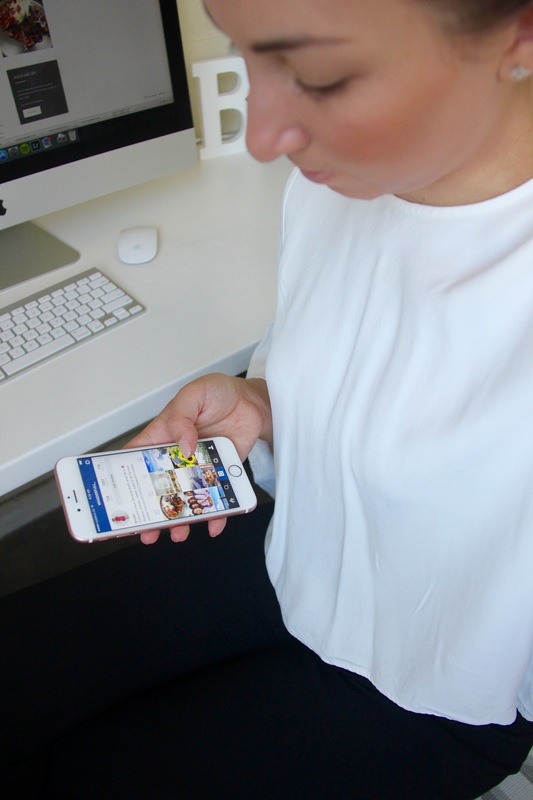 Once complete, you can share your story on your social media channels or via email and sms. For the bloggers out there, it even allows you to embed your stories on your blog and website! These days, the world we love is a little unstable and can be unsafe, so exploring unfamiliar ground can at times be a little unnerving. GeoSure takes the guesswork out of safety, giving you real time, relative, easy to analyse data on the safety and risk in your area. Travel safely between neighbourhoods knowing when you can walk and when you should get a cab, know when to leave a place at dusk or hang around. This app will even alert you of weather and environmental risks. Tourism is such an important part of many cities economies, and it should be encouraged. Smart travel really does come down to being aware – so in the words of GeoSure – leave the risk, and take the adventure! Here is my fast five top websites when it comes to travel! This website is my go-to source when planning a trip, and more often than not it’s my first stop! Trip Advisor is an online community for travellers, where they can share tips, reviews and ask and answer questions in friendly forums. The reviews are my main reason for using this site – if I’m going somewhere new and I’m not quite sure what activities are worth checking out, or maybe I’ve found a hotel I love but want to see what other guest experiences were like! It’s also a great place to contribute your own reviews and share photos from your travels – you might just help someone to plan their dream vacation! Launched by Trip Advisor, Seat Guru provides airline seat maps, flight shopping and flight information helping you to fly smarter. Find low airfares, receive real-time flight alerts and pick your ideal seat! Perhaps it’s your first time on a plane, or maybe you’re a seasoned traveller but this time you don’t want to leave your seat to chance. Seat Guru provides seat maps for just about every airline and every aircraft, providing tips and reviews on the best seat on board helping you to find the one you like best. My sister used this site for her recent trip to the UK – for her flight she found it was best to sit in the economy cabin on the top level of her plane, as it’s smaller so service is prompt. It also means it’s a lot quieter. When she was set to fly out, the two seats next to her ended up being vacant so she had an entire row to herself! 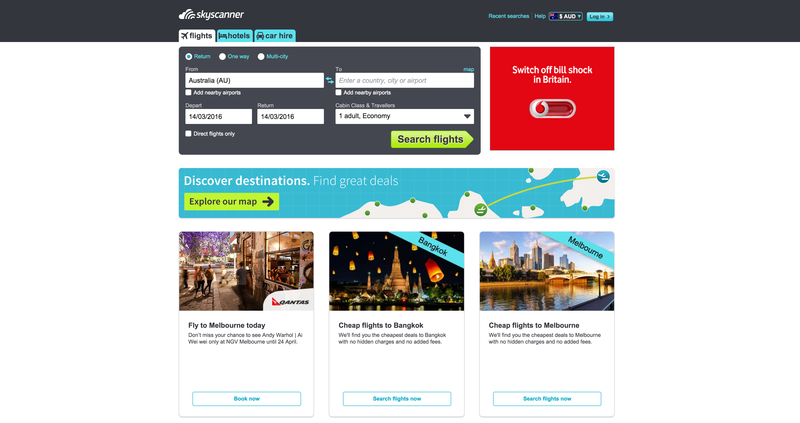 Comparing hundreds of airlines, across millions of routes, Skyscanner helps you get the best deals for your escape. They also compare prices on hotels and car hire – it’s your one-stop deal shop! Their technology connects you directly to everything the travel industry has to offer, totally unbiased and FREE. By connecting you directly to the airline or travel agent, they cut out the middle man, meaning you always get the lowest price. So many other booking and comparison sites hit you with additional fees once you get to payment – Skyscanner has no added fees, and no fuss! With a focus on saving travellers money, Yapta offers price tracking technology helping you to balance your travel budget and take the guess work out of whether it’s best to book now or wait and see! Stuck in transit or missed your flight? If you can’t get to a hotel or can’t afford the stay, sleeping at the airport might be your best bet! If you’re up to it, this website acts as your guide to a good nights rest, listing the best (and the worst) airports for sleeping in along with tips and tricks to get you through your stay.